In this episode, we cover how to ship your product to Amazon warehouses. What is a freight forwarder? Do you need a freight forwarding company? How to create your shipment plan in Amazon? Missed an episode? See them all here. We’re covering all of this today in our eighth episode of the Million Dollar Case Study. Watch the video, keep reading and don’t forget to claim your exclusive Flexport and Jungle Scout discount! Subscribe to the Million Dollar Case Study list here, so you never miss an episode! 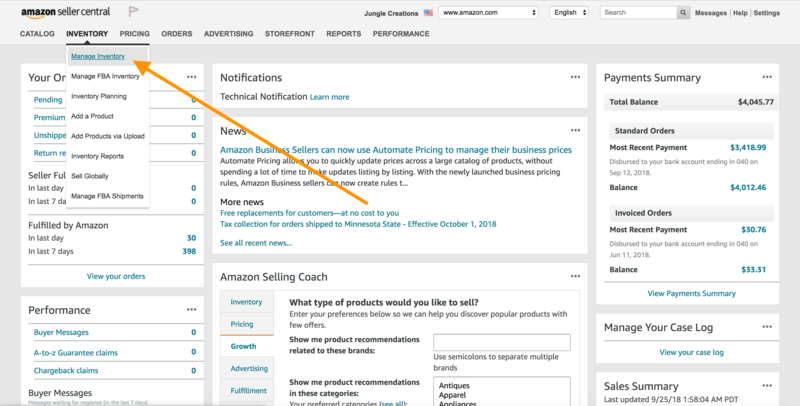 Before you get started, if you’re not already using Jungle Scout, you will need to get a Jungle Scout subscription to follow along with us and complete your product research. Welcome Back to the Million Dollar Case Study! For this episode, I interviewed Michael Gallardo from Flexport. Michael has years of experience in the shipping industry and explained how to get our private label product from China into Amazon warehouses. How do I ship my goods from China to an Amazon warehouse? What is the difference between FCL and LCL? The most typical ocean shipment is an LCL (Less Than Container Load) shipment. You’re going to be in an LCL shipment if your shipment is less than 18 cbm (cubic meters). Think about it as the space your product takes up as opposed to the weight. If you’re in this category, it means your product will be in a container with other shipper’s products. That container will be shipped to the United States and then offloaded at a container freight station before the cargo is prepped and sent to Amazon fulfillment centers. This is where a freight forwarder comes in handy! If your shipment is over 18 cbm, that’s when I’d be working with your freight forwarder to see if FCL (Full Container Load) makes sense. Typically FCL ships direct to an Amazon warehouse without unloading the container. 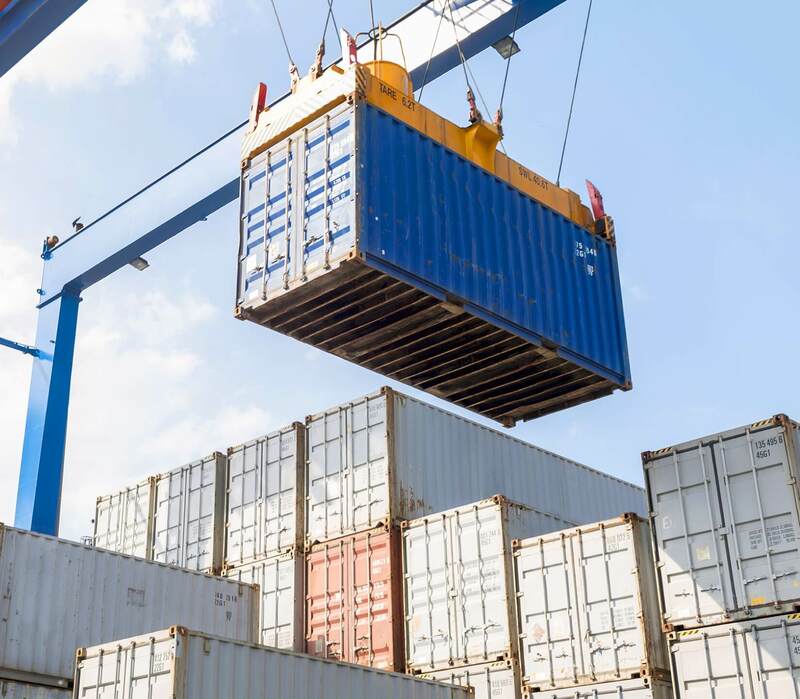 What are shipping container sizes? What is the difference between air shipping and sea shipping? Another consideration is to ship via air, which is usually a much faster and simpler process. But, it can be expensive. 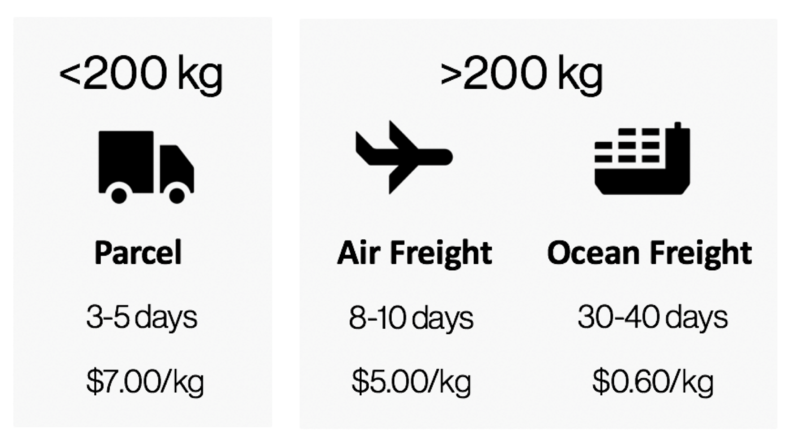 The chargeable weight is the weight which airlines will use when determining the cost of a shipment, and the carrier will charge you for whatever is greatest: gross weight or volumetric weight. How do I have my imports inspected? To ensure quality, always have your shipment inspected overseas by an independent third party, even if you have shipped with your supplier multiple times. 💡PRO TIP: try to negotiate (ahead of time) with your supplier for them to pay for the second inspection if the first inspection fails. How do I create an Amazon shipping plan? 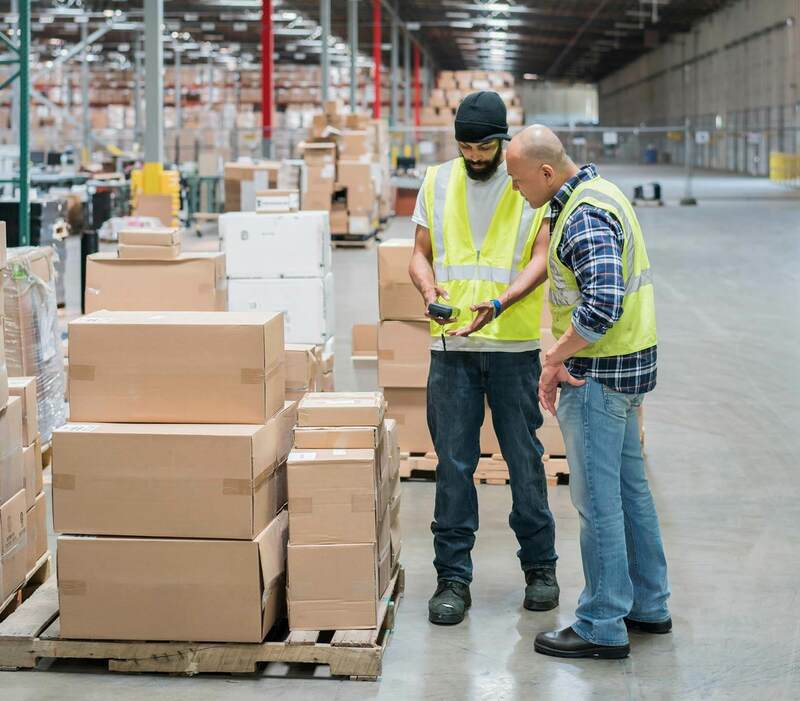 When you are shipping goods to Amazon, you must create a shipping plan in the Seller Central platform in order to get the correct addresses and information and ensure Amazon knows about your inventory and there are no setbacks in getting the inventory into Amazons warehouse. Shipment plans do not expire so it helps to set them up well in advance. Let’s walk through setting one up! First, from your home screen, you’ll want to select “Manage Inventory” from the “Inventory” tab. This brings us to all current product listings (next week we cover how to create the perfect product listing). From here we’ll navigate to the “Edit” button. Enter the ship from address. It’s important to note that the “Ship from” address is the location from which your shipment will be picked up for final delivery to an Amazon fulfillment center. Do not use the supplier’s address. Use the final destination your product will land at before going to Amazon – like the offloading warehouse at the port of entry. Select “Case-packed products”. Be sure to put all SKUs into one shipment plan. Next, we input the units per case and the number of cases. This information should be readily available from your supplier. Next, Amazon wants to know if they will be doing the packaging prep work (bubble wrapping, bagging, etc.) or if it will come ready for customers. I would highly advise you always have your supplier do all the packaging prep work as it is always the more affordable route. If you’re curious to know what Amazon charges then you can check out their pricing here. Let’s select “Merchant,” since we are having our supplier do the prep work. Now, Amazon is asking if they will be applying the FNSKU (an Amazon-specific barcode/identifier, we cover this in last weeks episode) labels on our product (at a fee). Once again, we want the supplier to handle this for us. However, before we advance from this screen we want to make sure that we select the “Print labels for this page” button in order to get a PDF file of our FNSKU. This is the file we would provide our manufacturer so they can add the FNSKU/barcode to our packaging. Amazon will automatically designate the fulfillment centers they want our product shipped to. As you can see below, my 100 case shipment has been split up into 3 locations: Pennsylvania, Florida, and Washington (unfortunately we don’t have a say in how this is divided up). Once, I’ve approved the shipments, then I can begin to work on each shipment plan independently. If it’s less than 30 cartons, you’re going to use SPD. If it’s greater than 30 cartons, then you can use LTL. How do I set the final delivery method? The estimated shipping cost will be in the “Shipping Charges” section. Then, you provide Amazon FBA carton labels to your freight forwarder. Your freight forwarder may be able to provide trucking services that are faster, although more expensive. How do I package my goods for shipping to Amazon? Should I ship via pallet? How do I label my products for Amazon FBA? If you’re using UPS or FedEx, each carton should also have a UPS/FedEx label, which is generated in Amazon Seller Central. If you’re using Amazon’s LTL trucking service, pallet labels will be applied at the destination warehouse. How long does it take to ship from China? FOB (Free on Board) – The supplier is responsible for getting your goods from the factory to the port. This cost is added to manufacturing cost. EXW (Ex Works) – The freight forwarder is responsible for getting your goods from the factory to the port. Should I buy freight insurance? What shipping documents do I need to know about? How can I get my inventory through customs? What happens during peak seasons? So realistically, you will pay your freight forwarder to handle all of the difficult parts for you. The key is to ensure you have a good relationship with them, communicate frequently, and be flexible in case they need any information from your or your supplier. Get $300 off your first Flexport shipment! Your Amazon success starts with Jungle Scout. Start doing some research of your own! With every blog post, we’ll be challenging you with “Action Items” to make the most of your MDCS journey. This weeks Action Items can be found here, in your FREE MDCS Workbook! After you’ve completed your Action Items, post your progress to the Million Dollar Case Study Facebook Group! You don’t have to reveal all of your best ideas – just let us know you’re working on them! You can also post them to Instagram with the hashtags #mdcschallenge or #freedombuilders. We donate 100% of our product proceeds to Pencils of Promise. They build schools in developing countries to help children get access to the education they need for a strong foundation. We love doing the Million Dollar Case Study. It’s a team-wide effort and we value every opportunity it gives us to connect with sellers like you. We contacted one of those QC companies you recommended, V-Trust, and their report is very detailed. We wish we knew about this before. OMG! We had some major problems with our supplier, and now the nightmares are gone. Hello Rolando, thanks for the recommendations regarding inspection companies. How come we didn’t know pre-shipment inspections before? We now use one of the companies you recommended, V-Trust, and their reports are fantastic. We’ve got no more headaches! Cheers! So if shipping spd with cartons. 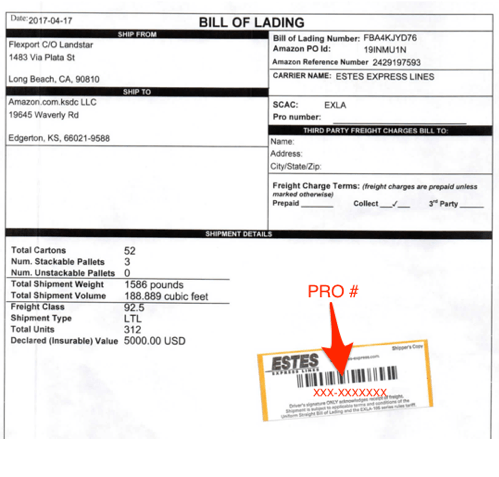 Do you get your freight forwarder to apply box labels stateside? And same if it’s lcl for pallet labels? Yes. Unless I’m shipping it to myself, then I do it. I registered my account to create my listing and a shipping plan, but my account has been suspended before I could do anything and I don’t know why. I’ve sent a lot of e-mail to the support team seller, but no answer. I’m not a US resident, but I would like to sell in the US. Do you know how to reach Amazon to have some answer? Thanks for such a great show and excellent info. I’m sending some products air express from the supplier in China. Is it correct to assume all the customs, duties and so forth are going to be taken care of on the supplier’s end or with the freight company, such as DHL? I’m wondering if I should get other people involved, like a freight forwarder. I’m new at this! (obviously!). Hi Michael my question is about shipping to Amazon FBA during December/January. Is it to late to ship into Amazon FBA as I’m guessing room would be limited with all the stock coming in? And would the freight forwarder be aware of this? Thank you very much for your valuable great content. I have paid my supplier for DDP services, does it mean all I have to do on my side is give him the address Amazon asks me to ship to and labels? And on “work on shipment” I am supposed to pick by “other” and be charged $0 because he is already doing everything for me? That should be yet. Just give them the labels. And yes. Pick other. I’m trying to figure out a good way to get quotes to ship air express to Amazon from the supplier to get started selling right away, while I wait for a larger order to arrive later. The problem is, I’m trying to determine if there’s enough profit margin before (obviously) I place an order. So, I don’t know how to give the supplier a shipping address to Amazon to calculate the express freight costs. Any ideas? What do you recommend? In my experience, LCLs usually run roughly $0.50-$1.00 per unit, whereas air freight can sometimes be as much as $1.50 per unit. All of that is subjective, of course. But if you’re selling lightweight, small products (that can fit roughly 30-40 per carton) that’s usually what you’re looking at. 1stly thanks very much for really great and valuable informations. I am following now this series and I have a question about the taxes. As said in this part when total weight is less then 200kg then we can send direclty to Amazon. Then who will be making custom clearance for me? And if I am not a company and I am not US citizen then can I again do this business? Depending on who handles the logistics, it will be provided by either the factory’s or Fex Ex (DHL, UPS, etc) customs agent. You might also look into a third party to help you with shipping/customs. Inorder to import my shipment in US to deliver it to Amazon warehouse, whether I need any legal documents since I am a non US citizen. In your experience, based on fees and service, can you highlight the differences? I am considering both companies today, but I have not decided yet. 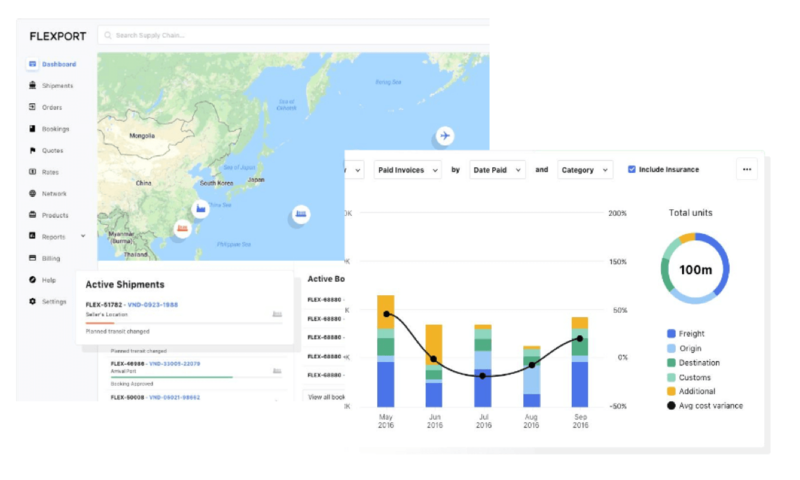 FreightOs expose some information what I fing really cool, but Flexport is very close if you are not a validated customer. Have you been following our Million Dollar Case Study? 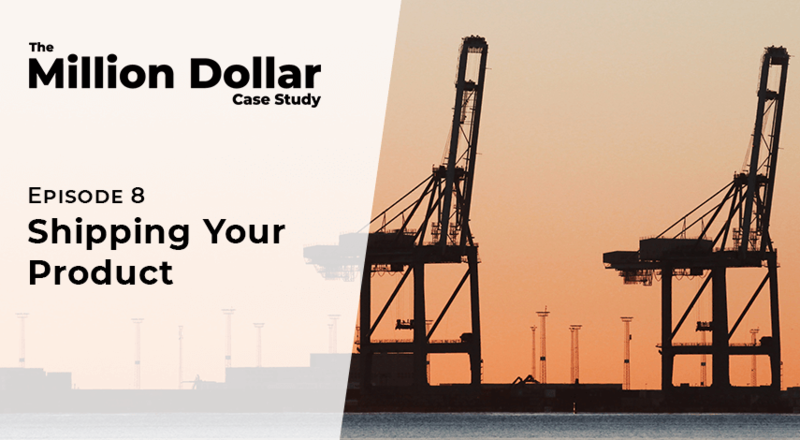 We just sat down with Flexport in a recent episode and discussed a lot of your shipping options with much more up-to-date info that should help you make a decision. Hope you find the episode helpful! How would the shipping plan change if I were to ship a small set by air directly from the supplier? e.g. what address do you put? the supplier’s address? who would then take care of the custom bonds, and other legal documents? You can hire a third party logistics coordinator to do that, or you can use the folks whom you ordered from. They usually have their own inhouse person that can do all that for you. If I want to ship a small quantity by air to arrive to amazon early, what should be the shipping from address to put in the shipping plan? Supplier? FedEx? Other courier? Have it ship from the supplier’s address. Ask them and they should give to you. Most suppliers are pretty experienced with dealing with FBA stuff. Hey guys , the telex release so it’s a sort of fast track for customs that can speed up the process? How do I get the telex release? Is it free? What are some rough estimates for trucking wait fees?? Hard to say. Most of the time it’s more about the volume than the weight. When setting up the shipping plan and entering the number of cases and units per case, what do you do if you have all cases the same, except for the last one, which has less? in my case, I have 2000 units (of the same product), and the supplier is putting 6 into each carton. So I will have 333 cartons containing 6 units and 1 carton containing 2 units? Good question. Used to be you could just send it and Amazon was cool with it. But they’ve recently changed their policy re: that. Separate out the 1 carton and do a different fulfillment for it with different weight/dimensions, etc. Then have the logistics person send them all as one. That shooooould work. Hello, I receive all other emails from JS like about the webinar etc but when I try to get the workbooks and enter my email then I never receive emails about that. I checked my spam folder etc. Thanks for doing this wonderful series. We’ve heard several people have had download issues so we’ve included the direct link to the MDCS workbook in the blog post. You can also grab it here. Thanks for bearing with us!